This is our summer special offer this week ('till 4th August 2016). If you spend £50 or more in the shop we will add this CD for free to bring inspiration to your car journeys. This magical, moving elemental tale of love, loss and redemption is narrated by Scottish poet Margot Henderson, with Ya'Acov as the Walrog, Susannah as Aramai, and with a beautiful,moving afro-celtic musical score accompanying the story as it twists and turns. Guitars, flute, sax, didge, voice, (Algy Behrens, Julian Marshall, Volker Kaczinski, Susannah Darling Khan) create an almost cinematic effect on the inner eye, and accompany you through the sea and sky scapes of this elemental, transformative journey. Listen to it as a gorgeous story. Listen to it as a parable about relationship. Listen to it as a story about the elements. The Walrog is loved by children of all ages all over the world. You can enjoy whether you are 6 or 00! 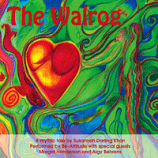 The Walrog book is also available from the shop, with its wonderful psychedelic illustrations by Susanne Perks.